Andy Parrish believes Morecambe’s game with Mansfield on Tuesday night is the start of a massive week in The Shrimps’ season. The Stags clash is the first of three home games in seven days with Newport, on Saturday, and Portsmouth, the following Tuesday, February 2, to come. 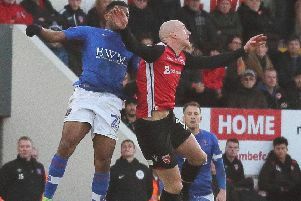 Jim Bentley’s side saw their four-game unbeaten end at high-flying Northampton on Saturday but Parrish knows a hat-trick of good results at the Globe Arena will put them right in the play-off mix. The central defender said: “It’s a massive week but it’s a good opportunity to get points on the board again. “We’re still in touching distance of where we want to be. “We go back home on Tuesday and if we can pick up three points we’re right back on it. “We had a bit of momentum going into Saturday’s game being four unbeaten and we need to build on that. “We took a knock on Saturday but three points on Tuesday and you’re thinking, right let’s look up again. “You’re always in with a chance. Northampton’s 3-1 win on Saturday was their 10th in 11 games and took them to the summit of League 2. Parrish however believes it is a good sign that Morecambe were so disappointed they didn’t take something from the game. He said: “They’re in fantastic form. “We went into it thinking we were going to get something though. “The lads were gutted and I think it’s good sign that we’re coming to these places thinking we’re going to get something. The Shrimps’ best period in the defeat came after they had gone 3-0 down with Parrish admitting Morecambe shot themselves in the foot. He said: “It’s the kind of squad we are, we’re never going to give up. “There’s always something to play for. We looked dangerous, especially late second half.